My wife was just away for the weekend, so I cooked for myself. I cooked meetballs and pasta and, because of the number of meatballs in the packet, the concoction lasted both the days my wife was away. Funny, on both days, my sugar was up at 16, which is far higher than I'd like. Needless to say, I was quite careful with what I ate, and I never normally notice a particular peak with a portion of pasta, so possibly the jar of ragu also had sugar in it? Anyway, last night I just had chicken kievs (I love garlic! ), with nothing else, and this morning my sugar was back down at 12. Provided I don't go crazy today, it'll be single figures tomorrow. It's funny how it seems to take 48 hours for everything to settle back down after a spike. Yay, my latest experiment arrived today. For the last few years I have really felt the cold, so have bought lovely warm sheepskin slippers. The only problem is, the absence of movement in my bad foot means that my left slipper can just slide off my foot, often in the most inconvenient of places. The middle of the garden is a good one, surrounded by chicken poo! the strap at the back of the croc will keep it on my foot. My wife has also pointed out that a rubber shoe might also be better, as regards treading stuff in from the garden, than a slipper. Is someone arguing the merits of their own argument, or the consequences of their opponent's? Are they telling you how good their argument is, or how bad their opponent's is? So just these two rules set me well on the way towards how much of what I hear is allowed to sink in. In poor old Corbyn's defence, I heard a lot of this from the Conservatives during the last election (and since), which was one reason I turned away from them. The debate last night, by the way, just turned into a party-political squabble, with the Labour guy saying the Tories were awful, and vice versa. You get that, you turn off. I gave up watching after 5 minutes. Very disappointing again. It has been quite poor of late. I'm sure I must have railled about this before. I watch Question Time, although somewhat less closely than I used to. A couple of weeks ago there was a guy on who I found very boorish. I don't think this was a politician, but he seemed to be espousing left-wing politics, to the point where he was talking over other people and therefore inhibiting the debate. My personal feeling is that you let your opponent speak, and people will quite easily judge for themselves whether they make sense or not. Anyway, with this guy, I couldn't help feeling that his views were probably not particularly consistent, and that it would be interesting to ask this chap about equality, for example, since he certainly was not prepared to give other people an equal chance to air their views. A week or so before that, I happened to get myself into an argument on the internet. It was on the page of a left-wing group (something called DIEM25) that I happened to follow. The reason I followed them is because I am quite sympathetic to their views. Anyway, they happened to be talking about one or other of their internal elections, and how they would apply positive discrimination to ensure an equal split between men and women. I don't believe in positive discrimination so I posted along the lines, "Gee, I'd hate to be one of the people who lost out because of this rule." The next thing, my race and gender had both been brought into the discussion - rather than discredit my argument, this politico had decided they would try to discredit me. Now I do think there are reasonable arguments for positive discrimination, but this guy chose not to go near them. So I highlighted what he was doing, and left the group. Whilst I had an amount of sympathy for them before, I certainly had less for them now. Similarly, some time ago I used to follow a left-wing singer called Billy Bragg. He was pro-European, and posted quite vocally to this effect. I pointed out that regardless of his view on this particular issue, there were many honourable left-wing politicians such as Tony Benn who'd been quite anti-EU, so even if you disagreed with them, it would be wrong just to class them as neanderthals and to dismiss them. Michael Foot was another example. I seem to remember that I was called all sorts of idiot for pointing this out - an inconvenient truth. (Not by the guy himself - I very much doubt he pays any attention to his comments - but by people who followed him. And so I do very much understand people's concerns about groups such as Momentum. 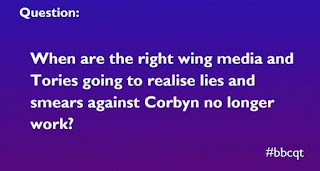 I can listen to someone like Jeremy Corbyn, and his views come across as extremely well-structured, he himself is very well-spoken and articulate, but the shadowy groups in his wings are somewhat more sinister. I'm not sure these people actually understand what their views mean or where they come from, let along appreciate that other people may not share their overall view or are at all clear on where agreement/disagreement lies. Hahaha, sometimes I think my choice of words could be better. I've blogged previously about my involvement with a peer support group, and I've just started a group on Facebook so we can all keep in touch between meetings. Because the group only meets fortnightly I think in terms of "on-weeks" and "off-weeks". Anyway, because this Facebook group now contains people who don't come along to the Playhouse every single time, I posted this morning that there was no meeting tomorrow because we were in an off-week. A friend of mine is the chairperson of a small charity. The last time I saw her was a few months before my stroke, when we had a good catch-up over a long lunch. I remember her saying that as a result of her being involved in this charity she'd been to a couple of the queen's garden parties. I also remember (or think I remember) that we both claimed to be republicans, so I didn't see the appeal. She said it was to raise awareness of her charity. Fair enough for her, but that wouldn't cut any ice with me. It did make me think, since I myself have had a stroke, and I myself am now involved in charity work, whether this changes anything. It doesn't, for me. Plus, I'm fortunate enough that if I was ever asked to do anything I didn't want to do, I could pass the buck to someone else and the charity would still have its awareness raised. I'm also in two minds about a blog I've started following, about a woman with early-onset dementia. She's just written a book and is currently, it seems, working very hard at promoting it. TV shows here and there, apparently. Well, many of us could relate to some life-changing event, including me. So, I wonder whether I could write a book? I mean, at the end of the day, it'd just be a book about me. For most of us, I suppose that is our favourite subject! I've written over a hundred blog posts in about the last year, it doesn't worry me one bit that I am probably the only person to read them - as much as anything it is for my own rationale - but whether a book would be of interest to anyone else is a different matter. I suppose you'd have to take a publisher's word that you had a "story". And certainly writing the book would not be a problem - there's plenty of material. Or the presumed financial windfall that it means. But this woman (in her blog) is writing about a seemingly endless round of publicity, which turns me right off. But at the same time, of course, she is very successfully raising awareness. You'd kind of feel obliged to seize that particular opportunity. And presumably that would be quite a difficult task to delegate? There's lots of "buts" in this post - I did say I was in two minds! Had quite an unproductive meeting with the nurse at my local surgery on Friday. So, on the plus side, I am on a tablet which can have a side-effect of raising potassium levels, but the level of potassium in my blood was normal. Also, when I had my stroke, the hospital put me on a statin. I kind of get the impression that they do that to everyone. So I was pleased that my cholesterol was very low. I take several pills per day as I'd always like to be on fewer. So I will think about that, but might stop taking it. The main subject, though, was my HBA1C, which was 70 (that number will mean something to anyone who's diabetic; for those who aren't, a value in the low-40s is considered healthy. I think the units here are mmol/mol if memory serves). I am already taking insulin so the nurse suggested that I go and visit the team at the hospital with a view to getting better control. I don't mind that - after all there might well be another insulin which will work better for me, or at least they might be able to suggest some improved testing method. Plus I have the time to go up there at the moment. But of course, at the same time, the nurse's instinct to push me on to someone more specialised meant that the meeting with her was effectively wasting my time. I lost interest at that point. I did want to talk about the possibility of trying one of the newer drugs to hopefully reduce my dependence on insulin, but clearly this woman was not the right person to talk to. So it all turned into a humdrum meeting. At the end, the nurse said that they normally did these checks annually, but that possibly, in my case, they should be doing them every six months? My own feeling is that if the result is just to be "you need to see someone else", then there seems little point in seeing her at all. I mean, nothing against this nurse, she was just abiding by the rules of her job, and I'd far sooner be pushed to someone else rather than be given the wrong information, but at the same time there was very little value in the meeting for me. I share the very popular belief that many of the drugs we get from the pharmacy started off as natural remedies, so people took them and improved on them and trialled them under testable conditions. I don't think the process is infallible, but contrast that with the "natural remedy" process, which has no benchmarks whatever. Yes, you read that right. Hypoglycmia, or just a hypo, is low blood sugar, which is always a risk when someone takes insulin, and indeed I've had three hypos in the last few weeks which is currently causing me to review my dose. Hyperglycemia is the opposite effect - when your sugar goes far too high. I can probably say from experience that this contributed to my stroke! I happened to have an afternoon nap this afternoon, and for some reason felt really thirsty when I woke up. Purely on a hunch, I tested my blood at 6pm, something I never normally do. Sure enough, my blood sugar was at 20! I immediately took a half of my evening insulin there and then. I waited until about 7:15pm, just before supper, and measured it again. It was still at 19 so I took the other half. I then had a very low-carb supper of cod in sauce, broccoli and cauliflower. I made sure I had very little sauce, and nothing else there should raise my sugar. So it is now almost 9pm. I need to wait until about 9:30pm, to let the food digest and give a true reading. Then I can decide how much extra insulin to give myself tonight. It's annoying to have to wait until then, but at least that thirsty feeling has passed. In one way this is good news. Never before have I "felt" a high sugar level, but this thirstiness is something I can use. Of course, I have to contrast this with the downsides, which include taking more insulin than I usually do and going to the other extreme! And, of course, the post mortem now begins. What on earth could I have eaten which sent my sugar so high? The two "newbies" today were some crunchy peanut butter (I had peanut butter on toast for lunch), but this was labelled "no added sugar", and some mint boiled sweets (which were labelled "sugar-free"). So go figure! This is only the second time that I've recognised a hyper since I started taking insulin. The only other time (which I attributed to white bread) was in hospital, where my sugar was tested hourly and went beyond 30! But very scary to know that you have such blunt instruments at your disposal, you just have to inject yourself then wait. At least at hospital, they put me on an insulin drip so we could gradually see my sugar go back down over the next 12 hours or so. Today I had Part I of my (annual) diabetes check. The nurse just took some blood to have analysed, so the visit was only long enough to get a sample. It's all in preparation for a further meeting on Friday, when the nurse will have the results in front of her. I pride myself in being quite hands-on these days in terms of my health, and so of course I have a view on what I want to know and what I'm not fussed about. HBA1C is really the headline value for diabetics, and is well-known. It is glycerated haemoglobin (sugar in red blood cells). This value extrapolates to an average of your entire blood sugar during the last couple of months. Ironically, I'm not too interested in this. I test my blood sugar directly every day with a glucometer, I store every result on the computer, so I know exactly how my blood sugar has been behaving over the last couple of months. No averages required. One of the things I am interested in, however, is my cholesterol, simply because during my stroke-stay in hospital, I was put onto completely fresh meds, and this included a statin. Just from the perspective of wanting to take as few meds as possible, I'd like to see how it is performing with a view to getting rid. On the other hand, however, the stroke has made me far less active, so maybe I need some help over-and-above diet? The second particular thing I'm interested in is my level of potassium. During this med-change, I was put on a BP medicine which was also known to reduce potassium. But I wasn't told this. I wasn't even told to get a blood test in a few months to make sure that everything was OK. I happened to request a blood test, entirely of my own initiative, about 3 months after the stroke visit. Lo and behold, low potassium! And we found it totally by accident! So this led to a second stay in hospital, right about the time of the Brexit referendum. So, you know when I'm critical of doctors? Well, this is a big reason. The upshot from the hospital visit was to change the med to another. This one was known to have the opposite side effect, that of raising my potassium beyond what is considered safe. But in fairness to that particular doctor, he did warn me about this at the time. So I keep tabs on my potassium ever since, certainly for the first six months or so, I requested a couple of blood tests specifically to find this. So now, if I'm having a test anyway, I always ask them to measure my electrolytes (which are the salts in the blood, and include potassium). No side effects seen to date. The visit was also an opportunity tomeet the new (<1yr) nurse, who seems lovely. It possibly helps that she knows my wife, who, of course, is also a nurse in a doctor's surgery. I can be quite critical of the overall service I got from the NHS, but I remember well one brilliant woman, an occupational therapist, who went out of her way to help me. It seemed that way anyway. I remember when my arm was newly-buggered, I stressed about how I would get home in my shoes, when I couldn't tie my laces up. This lady printed something off showing a one-handed method. Ultimately, I never used it, favouring instead some elastic corkscrew-type laces which don't need tying. But she went the extra mile for me. I never saw her immediately before my discharge, she must have been off. So I regretted that I never got the chance to say "thank you". I rectified that when I started volunteering, and ever since we've said Hi when we've seen each other. I saw her at my drop-in again today. So I've been thinking about how we can raise the profile of our peer support group. I was pleased that we agreed on a name and a poster, but I think they are just the start. Every time I visit the hospital stroke ward full to the brim, the statistics say that 80-90% of people survive their hospital stay, so where is everyone? Sure, people end up with all sorts of mobility issues which might prevent them coming into the centre of Salisbury. But not everybody, surely? Those of us who come along already obviously find ways to attend. So I guess the place to start in terms of raising awareness is in the field that I know. Bear in mind that in professional life, I used to be very handsomely paid in my jobs in IT. So things like creating a web site, for example, are a doddle. Plus, there are so many generators around these days, which mean the creation process is easier still. What I'd therefore be looking for as an early goal is that if someone sits in front of their computer and types in "Salisbury stroke", for example, then they should get a link returned which highlights us and what we do. So we can hopefully minimise ignorance as a reason for not attending. So, the obvious thing is to have some kind of web site. It doesn't need to do a lot, I mean clearly we're a very small group with very limited means. And again, I suppose traffic would be so low that that I doubt we'd ever top the list. But again, I have some expertise in that area so maybe I could contribute? I mean, there are other ways in which to use the available technology, lots of which are in place already. I'm a user of Facebook (I don't know if everyone else is, but certainly a few of us have become friends with each other) so maybe we could create a group so we could keep in touch with each other online a bit more visibly? So, at least is someone did a search on Facebook, they'd find out that we existed. Plus, of course, other social media sites are available. I mean, the only thing really is that I suppose most of the responsibility for actually doing all of this would come back to me. But it's not as if I'm pressed for time at the moment. I suppose, though, being a very consensual person, I have to put my money where my mouth is and make sure that everybody is happy with the idea. No point jumping the gun - we don't want to end up with fewer members because of this! The last thing I want to be is the newcomer who wants to take things over. I often don't think I'm a particularly positive person, but maybe I am? I know so much more about how the health service works, how charities work and how I work than I did two years ago. I feel really privileged to have seen all these. I'm just coming up to the second anniversary of my stroke, although my stroke happened over several days rather than being a single, milestone event, so maybe this is an appropriately-nostalgic post? I think that whatever people's actual view on something, the trait I really value is their self-consistency. Someone who believes Y because they believe X. Someone who will most likely believe Z because they believe Y. You get your basic values right, and everything follows from there. I don't believe it actually matters what their beliefs are, as long as people are consistent with them. Most differences are merely a matter of priority in any case - A over B? or the other way? But I remember things and after they are inconsistent, their word means nothing to me and I don't pay attention. Just like with justice, the best politicians should be blind. If you believe in one thing, then you don't put that belief to one side when the next issue comes along. At the moment, therefore, I have a lot more time for some right-wing personalities than many left-wingers. I think Corbyn himself is highly principled, but I don't get the impression that many of his followers are. I really don't think you'll get very far by saying what you've been told to say, by interrupting people so as to prevent them conveying their own message, and by simply making your own message louder each time. 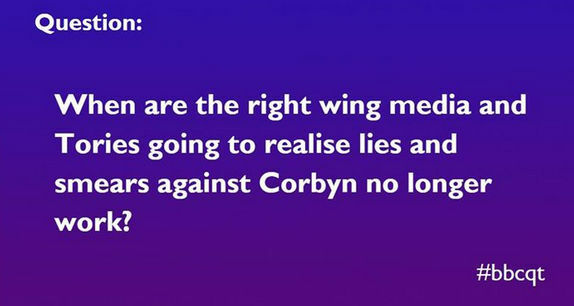 I have always been interested in current affairs, and have always leaned to the left, but that doesn't stop me admiring some right-wingers. Whether I'd vote for them is a different kettle of fish. And on the subject of Brexit, when I was a boy in the 1970s it was just a fact of life that this issue could split a party down the middle - that's just how it was and we all just accepted it. So it remains a mystery to me why modern parties feel that they must show a unanimous view to people. I especially regret that each side is so intolerant of the other's viewpoint. Plenty of decent, honourable people from all walks of life have highly principled views on this matter. Even though they might not share my view, it doesn't make them any less decent or honourable. Yay, we now have a semi-formal name. We've had an offer from the Stroke Association, who'll print some flyers for us, which we discussed when we met yesterday. Of course, the main title of the poster, right at the very top in big letters, is our name, so we had to decide what we wanted the group to be known as. I mean, it's only a label, there's not going to be anything set down in law or anything, but it's a first step. Aside from this, the idea of a flyer was well-received. I think that we realised, as there were only four of us present, that we could do with some new blood. We started off with a Stroke Association template, we tweaked it a little, and that was that. I mean, even if we'd have thought the template we started with was perfect, it would still need tweaking to reflect our unique name and address etc. - things which are over-and-above any whims we may have had. But this should allow us to post a permanent advert of ourselves at, say, the stroke ward. My wife also said there are plenty of flyers for all sorts of support groups on the wall at her surgery, so that sounds like more publicity. Legwork, but publicity. The group started off, long before my involvement, as a wroking-age arrangement. With the current attendees, though, I can't really see a specific age group, although many of us are youngsters. So working age maybe, but at the same time you're only as old as you feel! I think the restriction actually comes in the form of "level of recovery", and for some very practical reasons. Yesterday, four of us turned up, all of us were survivors, so it's undoubtedly a "peer" environment. Therefore when I see e.g. Harlow offering Speech & Language stuff......well, we simply don't have the facilities or the expertise to offer anything like that. So there are certain things that are just beyond us, plain and simple. What we can (and do) offer is a bunch of people who have all seen the world from a similar perspective, people who have probably been there and done it (between us, we have a whole lifetime of living with stroke). Not always, of course, which is why it's a two-way street and very much a peer-to-peer approach. The upshot, of course, is that someone who does require, say, speech and language therapy might find their time wasted by coming and chatting with us. Unless, of course, they want to chat as well.